Is Android share of Web lagging iOS share of Web? Of all the public statistics about platform share, Share of web use must be the most important measure for Google. The more browsing people do, the more searching they do and if Google search is most likely for a platform then the more income Google derives from that platform. 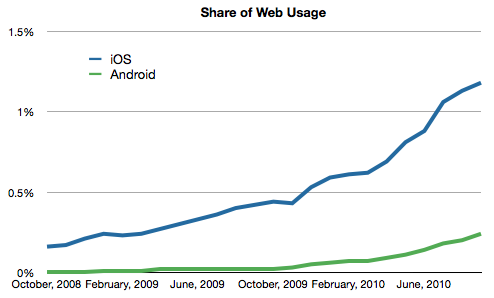 But Android launched later than iPhone, so everyone should be asking how rapidly the share of Web has grown since the start of each platform. When iPhone launched in 2007 it was almost competing with mobile web non-consumption. The alternative mobile browsing experiences were so bad that it’s hard to remember anyone putting up with them. A year later, the bar was set higher and Android filled a vast chasm of demand for mobile browsing for people who could not buy an iPhone. 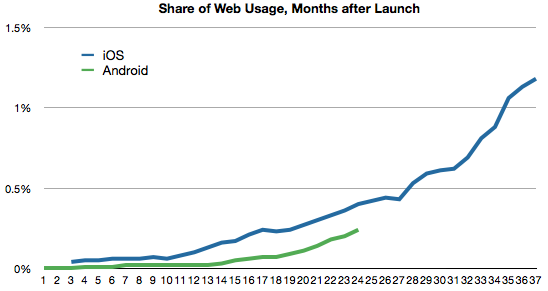 At the same point in the life of each platform, Android seems to be exploding in units sold. With this proliferation of Android licenses, it should be interesting to see if their unit share numbers are reflected in web share numbers. So far the story is not convincing. 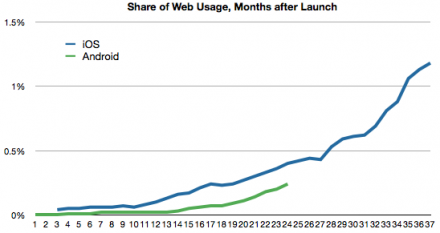 The growth in Web share is not pacing faster than iOS achieved at a similar point in time. So far, 24 months into the life of each platform, iOS leads by almost 50% higher share. iOS/mobile Safari has the advantage of iPod and iPad for distribution but that does not explain the relative lag of Android with respect to Web share as Android has a large number of SKUs. It may be too early to draw conclusions, but anyone trying to analyze Google’s strategy with Android should be paying close attention to this.